The 3* superior Beranek Hotel in Prague is situated just 5 minutes walk from Wenceslas Square, and 2 minutes from the nearest metro and tram stop. 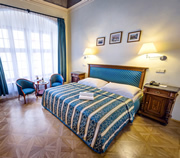 Beranek is a large impressive hotel set on a pleasant square filled with local cafés, bars, restaurants and shops. Rooms are well furnished and comfortable, with all the facilities one would expect from a modern 3* hotel. The 3* Corto Hotel is superbly situated in a pedestrian area in the heart of Prague, directly between the Old Town Square and Wenceslas Square, just two minutes walk from both. Corto Hotel is set in a charming 14th century building. The rooms and public areas have been tastefully renovated in a clean modern style which blends in well with the historic nature of the building. The 3* Superior Corto II Hotel is superbly situated in a pedestrian area in the heart of Prague, directly between the Old Town Square and Wenceslas Square, just two minutes walk from both. The hotel is set in a charming 14th century building. Rooms have been tastefully renovated in a clean modern style. The 2 two-bedroom suites come with lounge/dining areas, fully equipped kitchens and modern bathrooms. Julis is a stylish, modern hotel with huge floor to ceiling windows, giving the hotel rooms and public areas a light, airy feel. Julis also boasts the only swimming pool in Wenceslas Square, a sauna and a fitness centre. The 4* Elysee Hotel boasts an excellent central Prague location, right on Wenceslas Square. It is an elegant modern hotel. Rooms are spacious and well appointed with fine furnishings, and will suit both leisure and business guests. 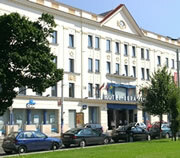 Hotel staff are friendly and the room rates are good, which makes it an ideal destination for any trip to Prague. The 4* Rokoko Hotel is situated right in the heart of Wenceslas Square in a classic Art Deco building. Bright new furnishings, careful attention to detail and an ideal city centre location combine to offer Rokoko guests a most comfortable stay in Prague. 4* Ramada Wenceslas Square Hotel in Prague is located in an excellent central location, right on Wenceslas Square. The fine, soft designs of the hotel rooms and public areas make the Ramada Prague City Centre Hotel the premier representative of the Ramada International brand in the Czech Republic. 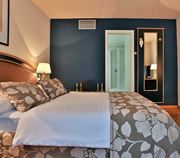 The 4* Elite Hotel is located in a quiet area of the old city of Prague. 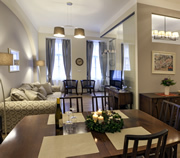 The Old Town Square and Wenceslas Square are just 5 minutes walk away. The hotel is a wonderful historic building with 78 rooms, all tastefully renovated and many of which contain original antique furniture. 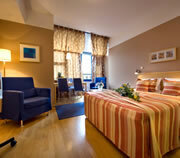 The 4* deluxe Majestic Plaza Hotel is situated in an excellent position, just off Wenceslas Square. A first-rate reconstruction project has transformed a classic building into luxurious city centre accommodation. Majestic Plaza is modern and very comfortable, with fine furnishings, and will appeal to all types of guest.